What did a volatility controlled approach to equity investing achieve in 2012 ? The above illustrates the performance and volatility of a strategy controlling to 10% volatility in a few different markets. The approaches all achieved high sharpe ratios – higher than the long term average we expect from vol control of around 0.35-0.4 (see here for some evidence supporting this). The strategies all ended the year close to 100% invested, meaning they will participate substantially in any continuation of the rally we’ve seen so far this year. However, as we all know 2012 in the end was an incredibly bullish year for all equity markets, with double-digit gains across the board, on relatively low realised volatilities. 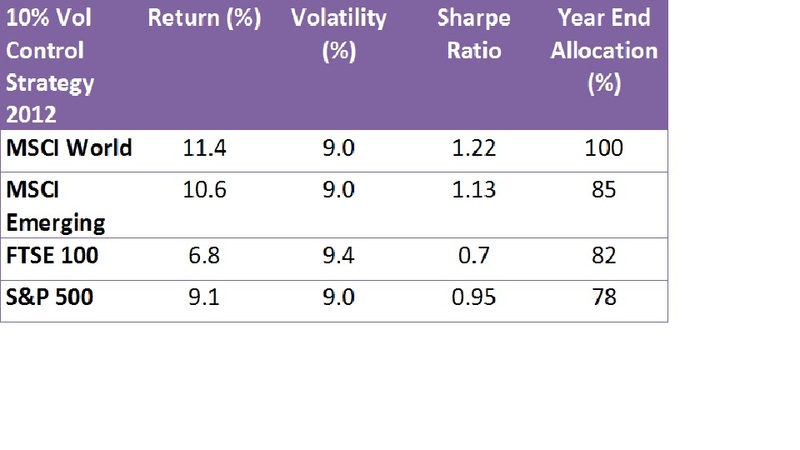 In fact most of the equity indices themselves achieved sharpe ratios in excess of 1, and in excess of the volatility controlled portfolios. Does this mean volatility control did not work ? No, we know from experience that equity markets tend to enter periods where we see large gains with relatively low realised volatility. However, they are also prone to large and significant drawdowns which can undo much of these gains. It is always true that a volatility controlled approach to deploying capital will lag behind an approach that simply allocates a fixed market value during an equity bull market. However it is the mechanism for de-gearing and conserving capital during the inevitable down markets that make it so useful over the long term. Who knows what 2013 will bring for equity market ? It probably wont be identical to 2012. Markets might be up significantly, equally given the multitude of risk factors out there they could equally end the year down substantially. Either way an approach that deploys capital on a risk weighted basis is a sensible way to approach investing.